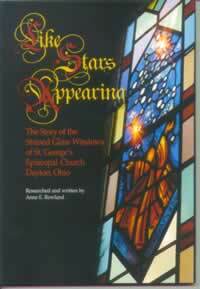 From the first light of creation to a vision beyond the end of time, “Like Stars Appearing” tells the story of God’s relationship with humankind as depicted in the new stained glass windows of St. George’s Episcopal Church in Dayton. Each window depicts a specific figure or “saint” - through whom God has worked. By combining their stories, and placing them in chronological context, the book tells a sweeping and epic tale. From Abraham and Moses to Jesus Christ himself, the foundation of the Christian faith unfolds. As history marches onward we meet characters from each century of the church from Augustine to Patrick to Joan of Arc to C.S. Lewis. The final window, ”For All the Saints” depicts the stars of heaven representing saints yet to come. A popular hymn asks the question: “Who are these like stars appearing, these, before God’s own throne who stand?” This book answers the question with a tribute to remarkable figures in the history of the world who answered God’s call in their lives. We invite you to “walk the story faith” in person or through this book. Available at the Parish Kiosk. Online ordering will be available soon. Written by Anne Rowland, with photographs by Paul St. Germain and Frank Gentner. Softbound. 125 pages in full color. Free with your donation of $25.00 email our Business Office. Take a virtual tour of the stained glass windows.